Buffalo has the distinction of being the first city to have facilities for facsimile telegraphy, the long awaited development of the telegraph industry. The Western Union Telegraph Company opened it's first regular commercial facsimile circuit between Buffalo and New York at 9 o'clock last night. And while at present Buffalo may send facsimile messages to New York, Gotham cannot send such messages to this city. A person may now go to the main office at the Western Union in the Rand Building, ask instructions for sending a facsimile message, and then write out a message on a typewriter within the type and frame for which the company has facilities for sending such a message. If this form is adhered to, the message may be sent to New York and it will arrive there exactly as it has been written here, and will be delivered to the addressee in that form. Western Union Facsimile Office in U.S. The Western Union added facsimile transmission, however as a supplement to it's own service of sending telegrams, said James L. Brady, superintendent at Buffalo. 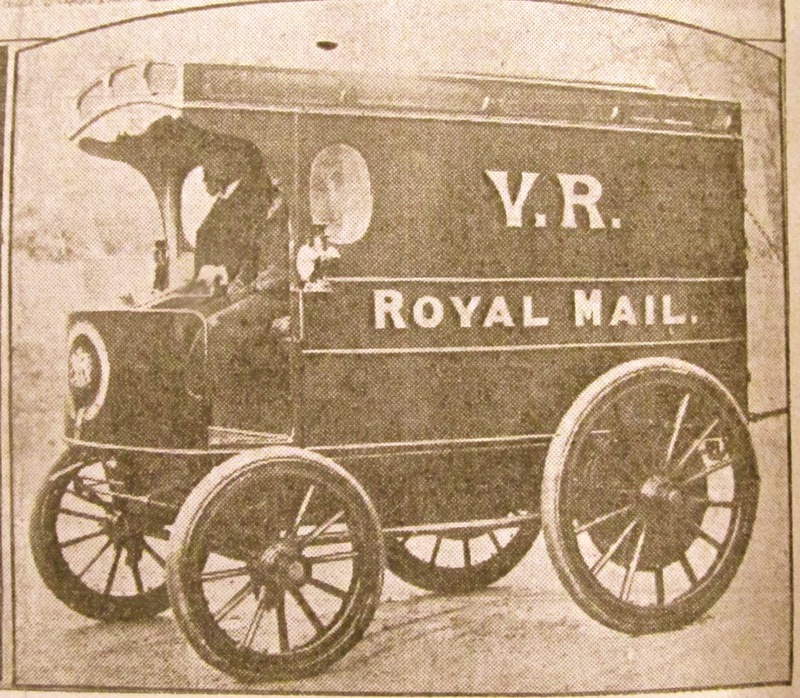 While the service at present is limited to typewritten messages, it is expected that the natural development of the service will mean that messages written by pen and ink may be sent in the same manner as typewritten messages. 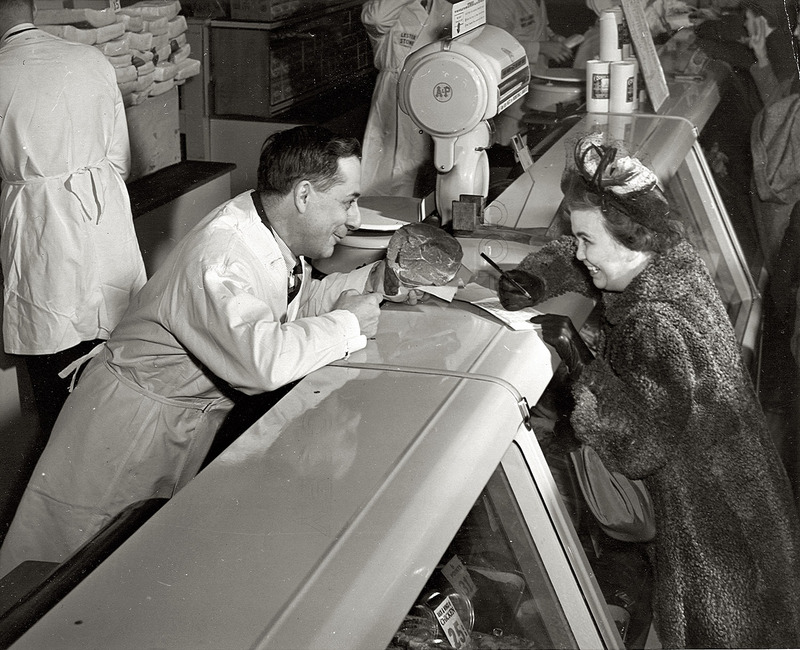 Inauguration of the Western Union facsimile system was announced by Roy B. 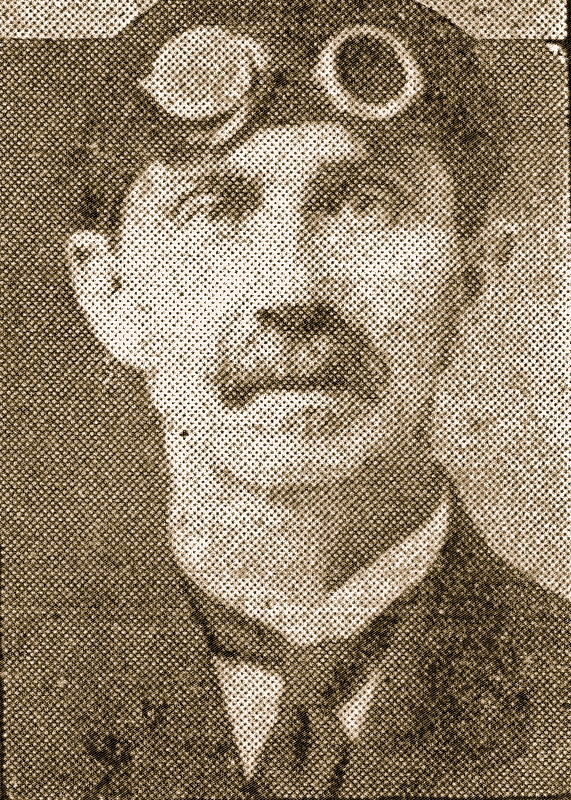 White, President of the Telegraph Company, as a development of much interest in the communications field. After a number of official greetings, the new system was placed in regular use in the overnight service from Buffalo to New York. No announcement has been made as to how rapidly the new system of telegraphy will extend to other cities, nor as to when the facsimile transmission of drawings, designs, tabulations and manuscripts will be available. It is understood however, that the latter is largely a matter of determining rates and conditions of service, since the system is equally well adapted to such functioning. It was not until 1920 that Western Union had any part in actual facsimile operations, and then in a limited way. In that year two Englishmen, H.G. Bartholomew and Capt. M.D. 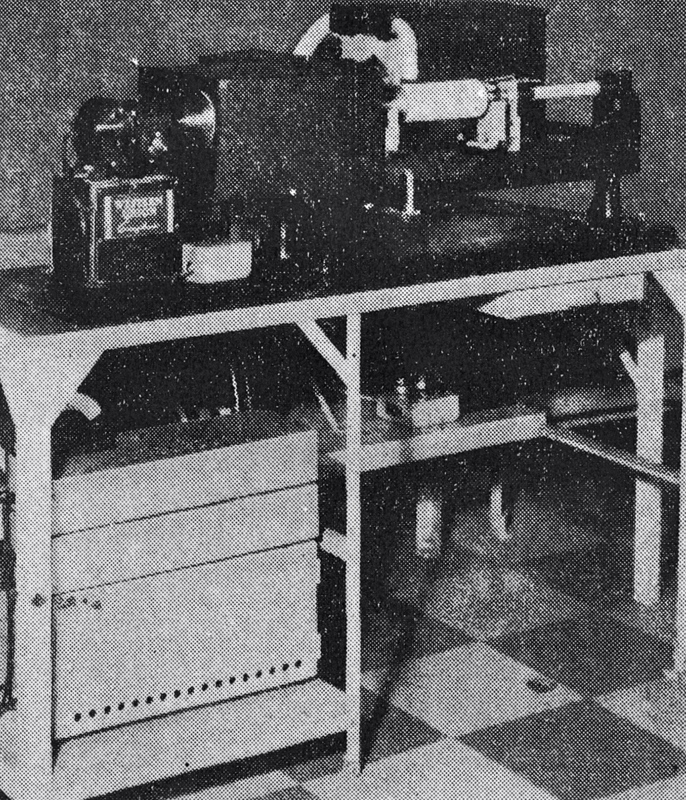 McFarlane, sent the first pictures ever transmitted across the ocean, using western union cables. 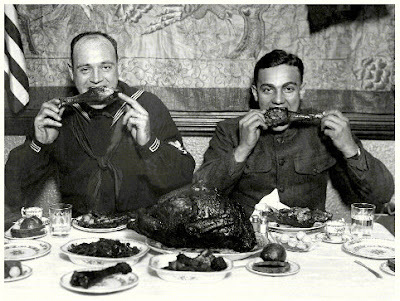 The pictures were taken at the international yacht races and Sir Thomas Lipton was one of the subjects. Other pictures were transmitted in following years and regular picture transmission over Western Union cables between New York and London was established in 1925 and has continued ever since. A group of newspapers headed by the New York Daily News, use this system. It's name, the Bartlane Process, was created using a part of the name of each inventor and it was patterned to coincide with the method of transmission used on the Western Union cable system. 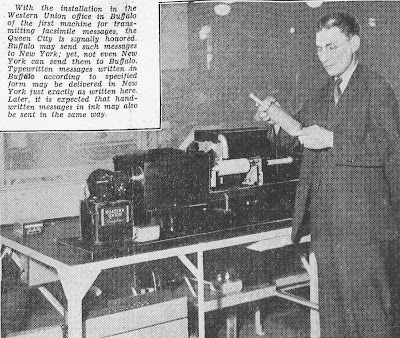 In 1924 and 1925, Western Union co-operated with newspaper interests in development of a facsimile system known as Telepix, for use between American cities. Slowness of the service and lack of great interest on part of the press or public resulted in discontinuance of the Telepix after one year. Much effort and money has been spent developing facsimile methods in recent years. A trans-Atlantic facsimile service was begun in 1924, and the telephone started a telephone service in 1925. This latter method of sending pictures, suitably adapted, is now being used by the Associated Press in a wire service by which news photo's are transmitted to certain of it's newspaper members. A year and a half ago Western Union engineers, under the stimulus and encouragement of President White, began to develop a facsimile method of transmission which would be fast enough and simple enough for regular commercial telegraph use. 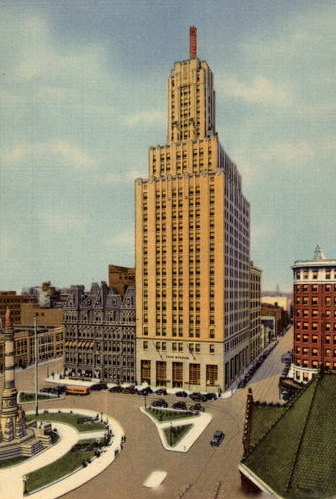 The Western Union facsimile system which now has been placed in regular operation between Buffalo and New York City is the outcome of their work. A Scottish inventor, Alexander Bain, began his career as an apprentice to a clockmaker. He actually invented the first electric clock, which had a pendulum powered by an electromagnet. This invention would come in handy when he started to think about transmitting messages. The fax machine he invented actually used clockwork principles and parts to operate. He patented the first primitive fax machine in 1843, some 30 years before the telephone. 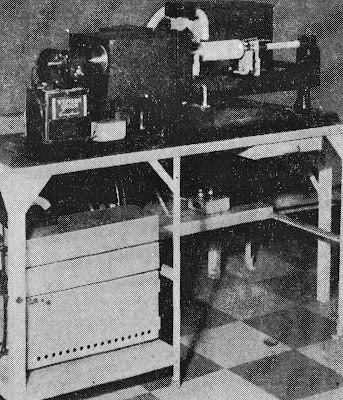 Called the "recording telegraph," Mr. Bain's invention used a stylus attached to a pendulum, which passed over metal type to sense light or dark spots on the plated "document" being sent. A pendulum on the receiving device made a stain on chemically treated paper when electric charges were sent on a telegraph line. The chemical he employed to saturate the paper was a solution of ammonia and prussiate of potash, which left a blue stain on being decomposed by the current from an iron contact or stylus. The signals were the short and long, 'dot' and 'dashes' of the Morse code. The speed of marking was so great that hand signaling could not keep up with it. 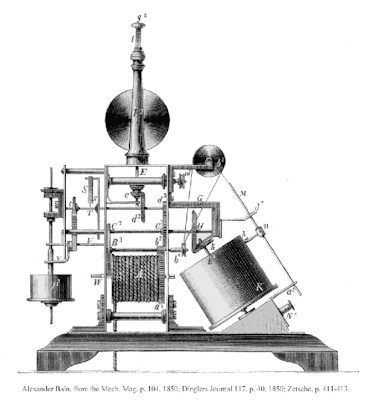 The chemical telegraph was tried between Paris and Lille before a committee of the Institute and the Legislative Assembly. The speed of signaling attained was 282 words in fifty-two seconds, a marvelous advance on the Morse electro-magnetic instrument, which only gave about forty words a minute. One of the most difficult problems the founders of Buffalo had to solve, was getting the Seneca Indians to give up their land along Buffalo Creek. 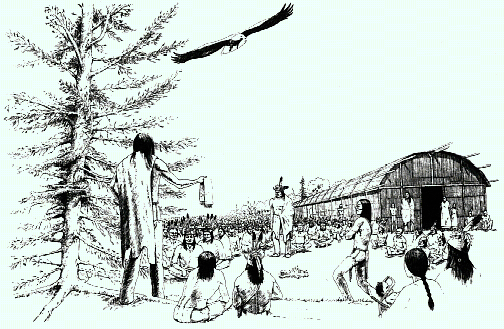 The first permanent settlement on the site of modern Buffalo was actually made by the Seneca Indians in 1780. On Buffalo Creek some three or four miles from it's mouth, the first Seneca villages were established during the Revolutionary War, after Sullivan's raid destroyed their old homes in the Genesee Valley. The proud and formidable nation fled, panic stricken, from their 'pleasant valley', abandoned their villages and sought British protection under the guns of Fort Niagara. Col. 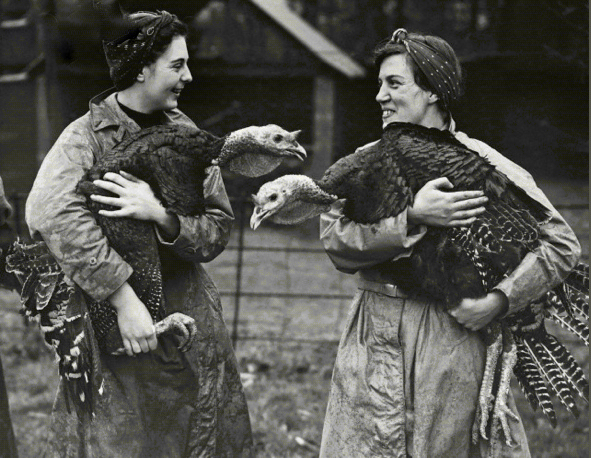 Guy Johnson fed the Indians from the British commissary at Fort Niagara during the winter of 1779-80. British officers from Fort Niagara encouraged some 1,500 of them to settle on Buffalo Creek to plant these places, to lessen the burden and expenses at the Fort. In this neighborhood was built a council house, at which councils and treaties of national importance were held. Associated with it are the names Young King, Farmers Brother, Red Jacket and other Native American celebrities. In this vicinity is the well known site of the Seneca Mission Church built in 1826 and abandoned in 1843. Indian Church Road runs through the old church yard and near the site of the building. The date of the beginning of settlement "was probably May or early June" of 1780. There had been no permanent abiding place there until that time. Soon after their arrival the squaws began to clear the land and prepare it for corn, while the men built some log-huts then went hunting. The Senecas at Buffalo Creek were under the leadership of Siangarochti, or Sayengareghta, and influential Chief, sometimes called Old King. His family alone raised seventy-five bushels of corn during that first summer at Buffalo Creek. 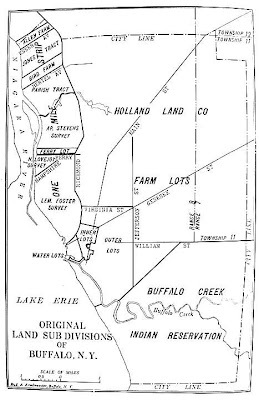 After the Revolution, the Seneca title to the land along Buffalo Creek was recognized by the government, and the Seneca Village occupied some of the choicest land in Buffalo. 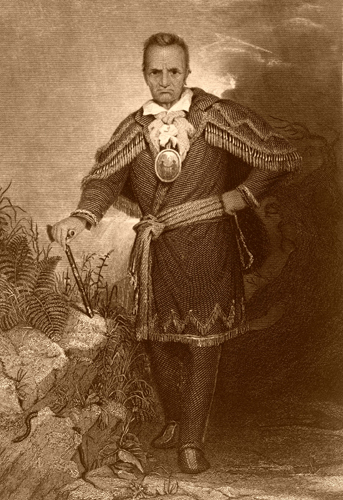 As the white settlers continued to come into Buffalo, the Indians became a greater problem. When Buffalo began to expand with the opening of the Erie Canal in 1825, the Seneca Indians became a first class "headache" for the Village Fathers. Those remnants of the once mighty Iroquois had not taken too well to the white man's way of living...but the Senecas legally owned the land, and they would not sell or move. In 1838, a combination known as the Ogden Company began negotiations with the Indians in Western New York, and in January of that year, a council of chiefs was held in Buffalo. 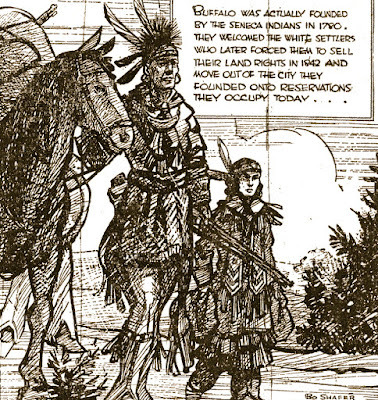 How the Ogden Company got the various chiefs to sign away their land rights is a dark and shameful chapter in Buffalo History. Scandalous methods of bribery and intoxication where used, and many of the signers were not recognized chiefs of the Senecas. The Ogden Company offered fabulous sums of money (which were never paid) and 1,820,000 acres of land in Kansas. The people of Buffalo were incensed over the way their Red neighbors were treated, and because of their opposition, the Ogden Company did not attempt to force it's questionable claims to the Indian lands. A committee of arbiters from Buffalo finally brought the dealings with the Senecas to a successful conclusion, and in May, 1842, the Senecas agreed to give up their land on Buffalo Creek and move to reservations set up for them at Cattaraugus and Allegany. 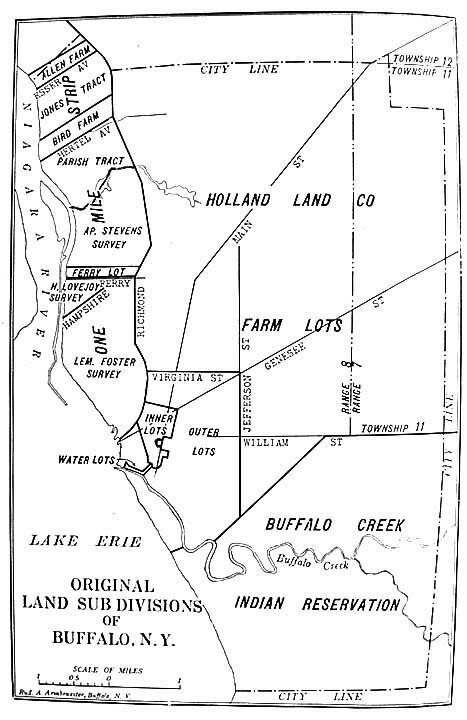 The Buffalo arbiters saw to it that the Indians were paid a fair price for the land they gave up at Buffalo Creek, but the Senecas at Tonawanda flatly refused to deal with the Ogden Company or the arbiters. The government finally bought the entire claim of the Ogden Company and dealt with the Tonawanda Indians seperately. True to their agreement with the people of Buffalo, the Senecas began to move out of Buffalo in 1842, and soon there were few of them left along the Creek. 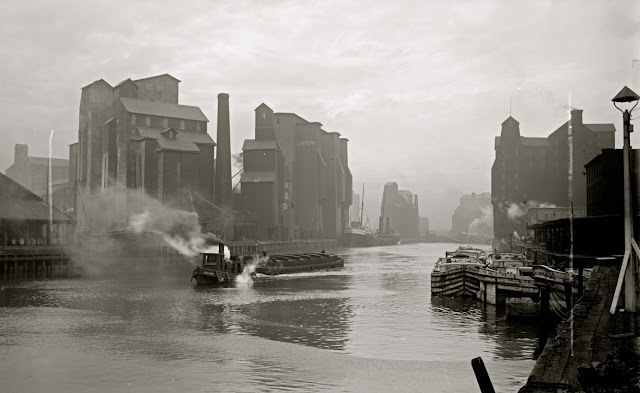 The land they once owned on Buffalo Creek has since become the heart of the industrial and shipping enterprises in Buffalo. his partner in exhibition ventures. 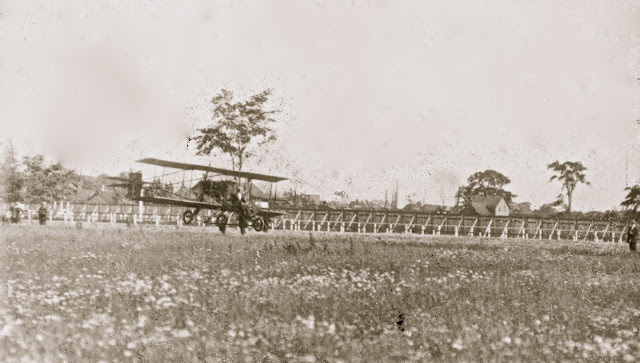 A Spidery looking contraption which made noisy and sometimes erratic progress through the air around Buffalo in the year 1911 evoked no little comment on the foolhardiness of it's sole passenger. Nevertheless the man that built that primitive airplane and flew it on the first flight across the Niagara River 18 years ago is still hale and hearty and as deeply interested in aviation as he was then. He is George Adell, 72 of 142 Masten Street, an employee of the Lamson Co. of Boston for more than 45 years. Back in 1872 when he was a boy in his teens in Auburn, he assisted an itinerant fakir to construct what would be known now as a helicopter. His lifelong interest in aviation dated from that day. 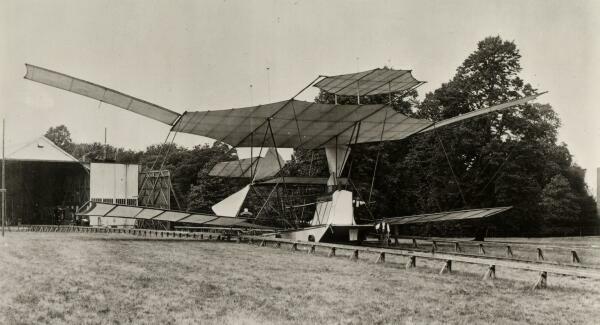 A portable steam engine was installed in the center of the platform and was surmounted by a huge propeller, which incidentally would not lift the clumsy ship, but proved a great drawing card for curious persons who were willing to pay money to see even an airplane that wouldn't fly. Five or six years later entered into a partnership with a Professor Baldwin and the daring couple spent several months making balloon flights at county fairs. The venture was a huge success until one summer day the valve in the envelope refused to function and they finished the flight from Auburn in a farmers apple tree ten miles away. That finished Mr. Adell's brief career as a balloonist. 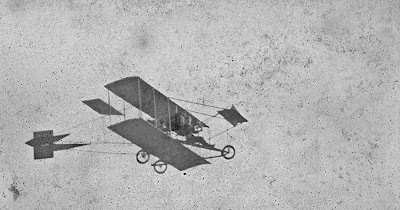 Mr. Adells interest in aviation, which waned somewhat after that disastrous experience, revived again after he moved to Buffalo in 1898, and when Orville Wright and Glenn Curtiss were experimenting, he decided to construct his own plane. He secured plans for nine different types of ships for the percival Marshall Co. of London, England, and choose the Curtiss ship as the safest and easiest of operation. At a cost of $2000 he built the machine in a shop in the Sidway Building in 194 Main Street. It was two years in the making. After several brief but successful flights in it from the Country club grounds at Niagara Falls, he made the longest trip up the river to Fort Erie. The decision to make exhibition flights when he took into partnership with him Charles Mills, an electrician aviator, who flew the machine over the Cataract for the first time. they demonstrated in all parts of the state with only one accident. In Binghampton one day Mills crashed from a height of 100 feet, breaking his collar bone and smashing the airplane. The dismantled ship is packed carefully in boxes in a warehouse in Tonawanda at the present time, but Mr. Adell has never lost his deep interest in aeronautics and is at present constructing planes of new and radical design. 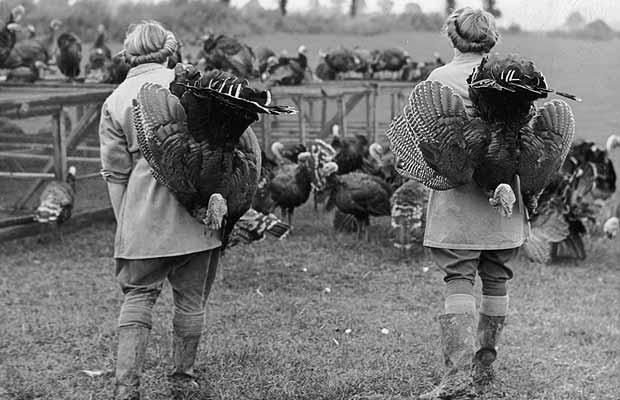 He Made the World's "Most Famous Hat"
Doughboys as the Famous "Tin Kelly." It seems that there can't be much romance in hat making, ordinarily, and not if it's an ordinary kind of hat. John Leopold Brodie, No. 806 West Ferry Street, found romance in his creation however, romance and adventure in quantities to satisfy almost anyone. It was Mr. Brodie who invented the Tin Hat of war-time fame. To Mr. Brodie thousands, perhaps hundreds of thousands allied soldiers owe their lives. 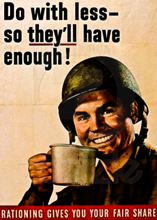 Many of the doughboys with a streak of curiosity to peek over the top of a besieged trench, were saved from an army blanket and last post honors by the tin hat. Mr. Brodies' hat was first chosen by the British Government, and later by the United States Government, as the most efficient life saving hat of more than 40 models offered them. Tests proved that the hat was so constructed that it was practically bullet proof, and the cushioning cage inside, resisted the shock. Under service conditions it was found that the hat cut down on head wounds by 60 percent. Mr. Brodie has many inventions to his credit. One was a chain steel visor attached under the tin hats and so arranged as to pull it down in front of the eyed for protection from shrapnel. Another war time invention was a message carrying rocket which could be set for a certain distance as the case might be, and save sending a man a man out under fire to a sure death. Also a face protector for tank operators, other were service smoke helmets and gas alarms, most of which saw a great deal of active service in France. He is also said to have developed the "stop and go" traffic light. He was born July 10th in Riga Russia and had an adventurous career. As a young man, Mr. Brodie went to South Africa and was subsequently interested, as an owner, in the development of diamond and gold mines there, and eventually made a fortune in gold and diamonds at the Kimberly and Johannesburg treasure mines. For several of his years there he was closely associated with Cecil Rhodes. He returned to England and invented a chemical process for the manufacture of salt and engaged in that business until 1914. He is said to have refused a Knighthood in England and to have come to Buffalo just after the armistice to live, solely because his wife (Eleanora Thompson), wished to live in the city of her birth. Mr. Brodie for a number of years has been one of Buffalo's most distinguished citizens, richest of all local war millionaires and possibly the wealthiest man in the city. He received his U.S. citizenship in 1924. Although reticent about discussing the invention of the most famous hat in the world, he says he conceived of such a hat after statistics showed that about 750 out of a thousand wounded soldiers were suffering from head wounds. One of the tests that Mr. Brodie put his hat through in order for the government to accept it from among 40 or 50 others, was to put it on his head and allow it to be struck with a heavy steel bar. He had so much confidence in his invention that he was even willing to have the government inspectors shoot at the hat with a 45 caliber revolver while he was wearing it. This was not considered necessary, however. Mr. Brodie is asking a royalty for the use of his invention from the United States Government. So far he has received nothing but the heartfelt thanks from the thousands of American soldiers. They didn't know who to thank for the hat when they were in the trenches, and they probably never will know, but they say thanks just the same. 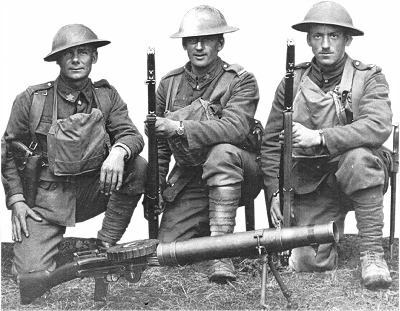 During the first year of World War I, none of the combatants offered steel helmets to their troops. The soldiers of most nations went into battle wearing simple cloth caps that offered virtually no protection from modern weapons. German troops wore the traditional leather Pickelhaube, also of little protective value. The Brodie helmet (also called the shrapnel helmet or Tommy helmet, and in the United States known as a doughboy helmet) was a steel helmet designed and patented in 1915 by John L. Brodie. The War Office Invention Department was asked to evaluate the French Adrian design but they decided that it was not strong enough and was too complex to allow quick mass production. The design submitted by John L. Brodie offered advantages over the French design as it could be pressed from a single thick sheet of steel, giving it added strength. 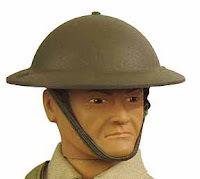 The British Army first utilised the helmet in September of 1915 but it was not until the spring of 1916 that the helmet began to be issued to British troops in large numbers. It was first used in battle in April 1916 at St Eloi. Troops from other countries in the British Empire also used the Brodie helmet as did the United States when they entered the war in 1917. The United States Government initially purchased some 400,000 helmets from Britain.